A number of years ago, I had an opportunity to look at undertakers reports from 1863 held by the Illinois Regional Archives Depository (IRAD) at Northeastern Illinois University. I was thrilled to find these pre-fire death records and asked about the possibility of offering my help to index them to make them more accessible. I was told that there was a project already underway. There was! In 2008 the Chicago Genealogical Society published a book titled Chicago Cemetery Records 1847-1863: Sexton's Reports and Certificates, Treasurer Receipts, Deeds, and Undertakers' Reports. It's a useful resource for early Chicago research and I'll introduce you to it in this post. Below you'll find the main sections listed along with an example entry and a quick summary (in parenthesis) of what the information means. The book includes a name index which makes it easy to use. Chicago Cemetery Records 1847-1863 can be found in many libraries (see WorldCat Entry) or it can be purchased from the Chicago Genealogical Society for $40.00. Have you used the book? Has it been of help to you? The book also includes Chicago ward boundaries 1837, 1851, 1857, and 1863 and information about the IRAD system. 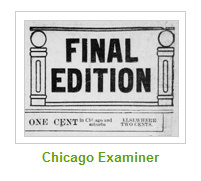 Recently Bonnie Brown, a fellow Chicago researcher, sent a message to the IL-COOK-CHICAGO-L list at Rootsweb to make sure that we were aware of a free online resource for Chicago newspaper research -- Harold Washington Library's digital images for the Chicago Examiner, 1908-1918. It wasn't long before people began posting news of their success in finding family-related information. If you haven't explored images, you should! If you want to browse the newspaper by topic, you can access it through a link from the library's Digital Collections page. Highlights include "Cubs World Series," "White Socks World Series," "Eastland Disaster," and "Plan of Chicago." Other topics include "Jane Addams and Hull House," and the "1912 Olympics." If you want to search the newspaper, go to the library's main page, click on "A-Z Research Databases," click on the letter "C," and select "Chicago Examiner." 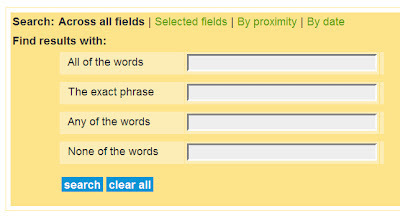 but I'd recommend using the other search options, too. 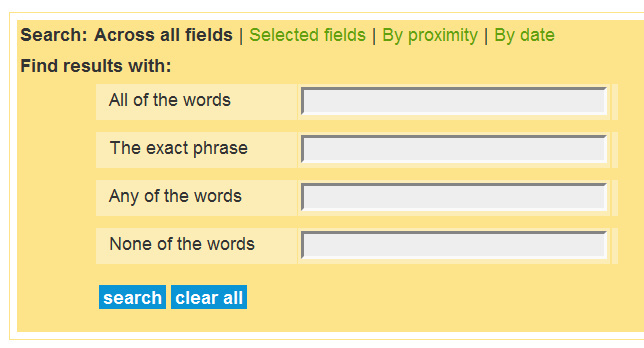 These include "Selected fields," "By proximity," and "By date." Give it a try. And if you find something you'd like to share, post a comment. Cook County marriage license images, 1871-1920 are online for free at FamilySearch up through 1920. If you find that your ancestors were married by a justice of the peace, it's likely that there's no other marriage record available. The Cook County Circuit Court Archives website says "Justice of the Peace Court records were destroyed as allowed by Illinois statute in the early 1970s." But, if they were married in a church, there's a good chance that you can find a church marriage record and in some cases--if it was a Catholic marriage in a Polish parish, for example--the ecclesiastical record might have additional information such as witness names or parent names. If the church name is listed on the marriage license, the next step is to find where the records are held. The Newberry Library's "Guide to Chicago Church and Synagogue Records" is a good place to start. But, if the church name isn't listed, you'll have to do some detective work to figure it out. If the name of the priest or pastor is easy to read, try checking the name in a Chicago city directory. They're online at Fold3.com and many of them are also available online for free. Check the "Tools Tab" at ChicagoAncestors.org, for example. If the name isn't easy to read it's a lot harder. Recently, a researcher sought help from the IL-COOK-CHICAGO list at RootsWeb. The priest on a license was listed as "Carl A." but what was the surname? What letter does it start with? N? M? St? And it looks like "ead" but is there an "h" at the end? "eadh?" I skimmed the names of Catholic priests in city directories c. 1915, but, unfortunately, most of the entries just had initials for given names so there was little chance of finding the name Carl and nothing resembling the surname caught my eye. To help with the search, I typed the address in at ChicagoAncestors.org to see which parishes were close by but still no match. I even checked the marriage register images for the closest parish to see if there was a priest with a similar name making entries. There wasn't. I decided to check the marriage license on microfilm at the Wilmette Family History Center to see if better contrast would help me decipher the writing but no luck. I enlisted the help of a FHC volunteer and long-time Chicago researcher and we puzzled over the name, skimming the index to a two-volume Chicago Archdiocese history, but still no luck. Finally she said, "It must be an Episcopal priest." It didn't seem likely -- the bride was Irish and the groom had a name that looked to be Polish -- but I decided to check a city directory anyway. Skimming the entries for Episcopal churches, the name jumped out at me almost immediately. Rev. Carl A. Nybladh was the priest who performed the marriage ceremony.